Talk about making waves: J$P gets noticed by Media Matters! Plus the Sherrod debate brings us its most flagrant liar yet. It’s all in an exciting update edition of Fox Haters Week in Review! Now with a Major Update! Not true, Johnny Dollar whines, because nobody at Fox News touched the story until Sherrod resigned, so Fox News wasn't peddling the smear campaign, as I suggested to MSNBC. Please note the language I used. I referred to "a character assassination attack that Fox News was peddling." But Johnny Dollar says no way because nobody at "Fox News" touched the story until after Sherrod's resignation a week ago Monday. Has Johnny Dollar ever head [sic] of the Internet? Because if he had, he'd know that there's this whole division within "Fox News" (i.e. FoxNews.com) that publishes news and commentary online. And if he had heard of the Internet, he'd know that "Fox News" peddled the bogus Sherrod story before she resigned. But is that truly what Boehlert was talking about with Ed Schultz: one post on a website? Note that nowhere in the conversation does anyone mention online posts at foxnews.com. In the setup piece for the segment, Schultz rails not about foxnews.com, but what aired on Hannity. When Boehlert joins him, he could have said it was a foxnews.com report that influenced the White House, but he didn’t. Instead, he talked about a “smear campaign” from Fox News. And now he wants us to believe that the “smear campaign” he was talking about was not Fox News Channel but merely one online report? And that one report is what the White House reacted to? Really, a Senior Fellow should be able to express himself more clearly than that. So do you believe Boehlert’s apparent ret-con? That’s a question of credibility, and when it comes to discussing Fox News Eric’s track record for veracity is spotty at best. After all he claimed that Fox News wasn’t interested in FOIA requests under the Bush administration, but oops, that was untrue. He concocted a smear of Glenn Beck out of misrepresentations and falsehoods. And of course there’s the time he lied about FNC’s tsunami coverage, and didn’t bother to make a correction even after the true information was emailed to him. We admit it. We’ve got a long way to go before we can approach the level of accuracy and honesty of a Media Matters “Senior Fellow”. And it didn’t prevent the wall-to-wall character assassination which the network engaged in all day Tuesday, until the full, exonerating version of the tape of Sherrod’s speech was finally made public by the NAACP Tuesday night. By 9amET Tuesday, all three cable news networks – CNN, Fox News and MSNBC – were reporting the story in full context. They were all showing the clip (many times), but also all pointing out that Sherrod was speaking out against it. Fox News runs the distorted clip continuously on all of its shows Monday. 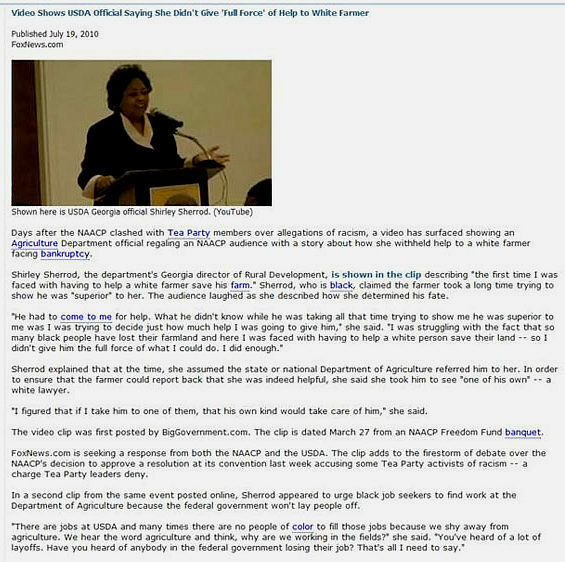 Before giving Shirley Sherrod a chance to tell her side of the story, the Agriculture department demands and receives the resignation of the head of its rural development office in Georgia. Not surprisingly, his latest screed makes no mention of the falsehoods he was spewing just days earlier. The truth: the tape was not played, and the story was not reported on FNC until long after she had resigned. That’s not a matter of opinion; it’s fact. Sorry, there’s only way to say this. Howard Dean: you lie. UPDATE: Did Media Matters lie in its published “timeline”? Eric Boehlert is hanging his hat on the claim that foxnews.com published a report on the Sherrod video before she resigned, and that online report influenced the decision to fire her. Media Matters timeline places that foxnews.com report after Breitbart’s video (11:18 am) and before a Jim Hoft blog post (12:13 pm). But they don’t document when the foxnews.com article was actually published. No timestamp. Here’s the interesting thing. The article in question was not removed from foxnews.com. It was simply updated with new information as it came in. The current version of the article is still in the same place, including the 7/19 date in the URL. What’s more, all the comments are there, dating all the way back to the first version of the piece from 7/19. And when you jump to the earliest comments, the first one is timestamped Monday July 19...at 6:22 pm. Since Sherrod’s firing wasn’t made public until later that evening, these comments are clearly from the first version of the post. Shirley Sherrod was not mentioned on Fox News Channel, or on foxnews.com either, until after the Obama administration had forced her out. Note: See the post that started this all here.